The potty putter turns any bathroom outing into a memorable one! - Simply set up your set and you can play golf whenever you please. - Great excuse to leave the party and avoid small talk, because of your "stomach ache." 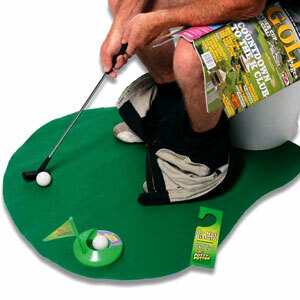 - Funny gag gift that will help improve your putting game. - If you can putt on the pot, you will be a pro on the green. 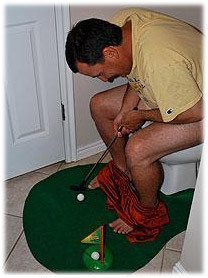 - The Potty Putter is the perfect gift for yourself or that avid golfer in your life. My dad is quite the golfer and I thought this would be the perfect present for him...I was right! He now seems to always have to go to the bathroom. He loves putting it out for friends. 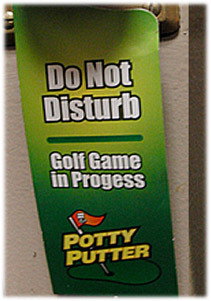 Funny and great gift for the golf lovers. The potty putter was the least expensive Christmas gift I gave this year, but it was by far the best! I got one for my dad and father in law. They are both aspiring golfers and the potty putter was the perfect gag gift. 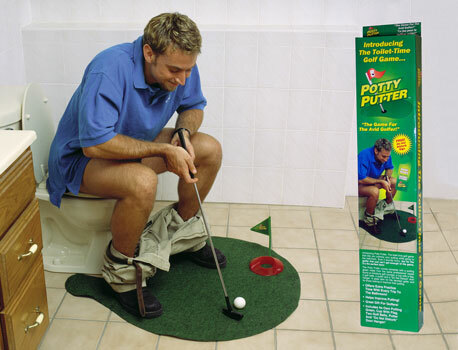 Just wanted to let you know what a hit this "potty putter" was for the holidays. With the cold weather the guys have been playing cards and this just added a fun element. My husband's friends had a blast. There was a constant line to the bathroom. haha thanks for this great product.